I am hard-wired to eat for the seasons. So as soon as the weather dipped below 70 degrees last week, I had one thing on my mind: Soup–and lots of it. Plus, I had spent most of the previous week traveling. I was in Colorado for five days for a yoga workshop (the third Anusara Immersion) and then off to Idaho for a quick Labor Day vacation. In other words, it had been a while since I’d had a home cooked meal and there was nothing I wanted more. So, last Friday, I spent a chunk of time hunting for recipes online, shopping for ingredients, and then cooked up a storm all weekend long. Starting with this satisfy-your-soul meal that I made Friday evening, which we ate while watching Mad Men DVDs. Bring it, Fall. 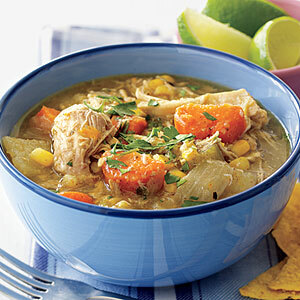 I found the original recipe on one of my favorite healthy recipe websites, myrecipes.com, which aggregates recipes from a variety of magazines including Cooking Light, Health, and Real Simple–some of my faves. (Oddly, my byline has yet to appear in any of them. Achem, editors?) This one originally ran in Cooking Light. However, the directions say something about draining something through a sieve. Huh? I had no idea what a sieve was (my mom later informed me that it’s nothing more than a strainer) so I decided to ignore that part and go on my merry way making soup the way I knew how. 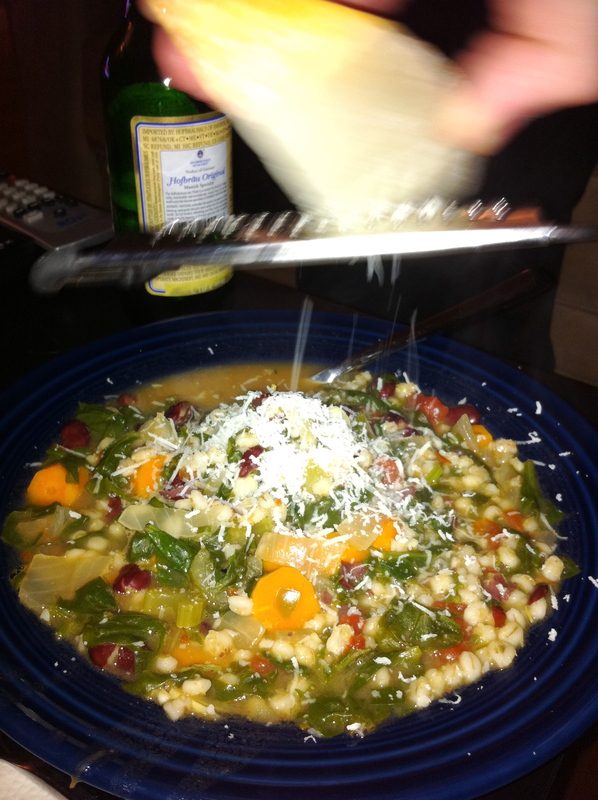 Sieve or no sieve, this soup was a total success. Follow package instructions for cooking barley on the stove. While that’s cooking, in a separate large pot, heat oil over medium heat. Add onion and carrots plus some salt, pepper, fresh rosemary, and red pepper flakes (1/4 tsp or more depending on how spicy you like it) and saute until veggies are softened, about 10 minutes. Add celery and garlic. Saute 5 more minutes. In a bowl, mash one of the can of beans using a fork. Add the mashed and whole beans, broth, and tomatoes to the pot. Bring to a boil. Cover, reduce heat, and simmer 15 minutes or as long as you like. Before serving, tear spinach and add to the pot. Add cooked barley. Season with more salt, pepper, and cook until all of the spinach is wilted. Serve warm & sprinkle with freshly grated cheese if you like. This entry was posted in Soup on September 13, 2011 by Paige Greenfield.